Left to right: Wallace Shawn and Andre Gregory. “Our minds are just focused on these goals and plans, which in themselves are not reality,” Andre (Andre Gregry). “Goals and plans are not... they're fantasy. They're part of a dream-life,” Wally (Wallace Shawn). - From My Dinner with Andre. 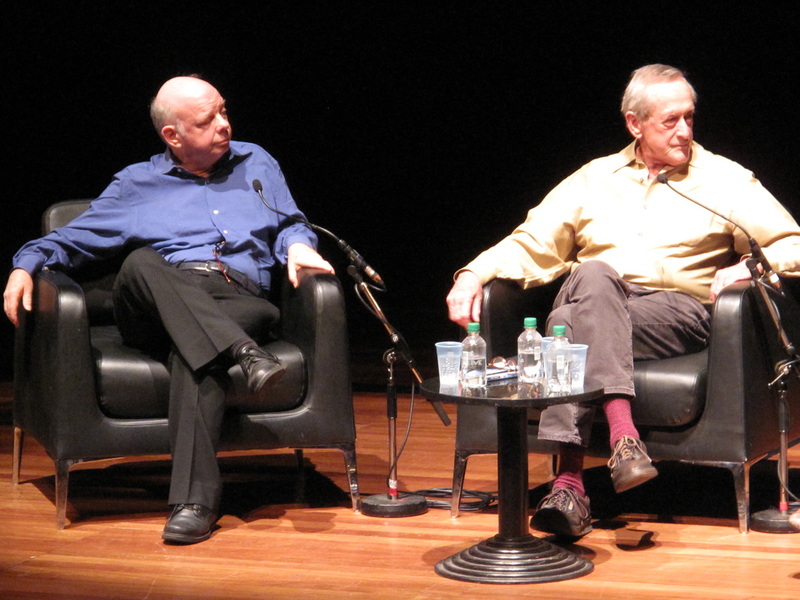 Two theatre legends were reunited in the Queen Elizabeth Hall of the Southbank Centre, London, on Sunday 2nd October for the 30th anniversary of their seminal film, My Dinner with Andre. Playwright and actor Wallace Shawn, director and actor Andre Gregory. They were there to discuss their collaborations. 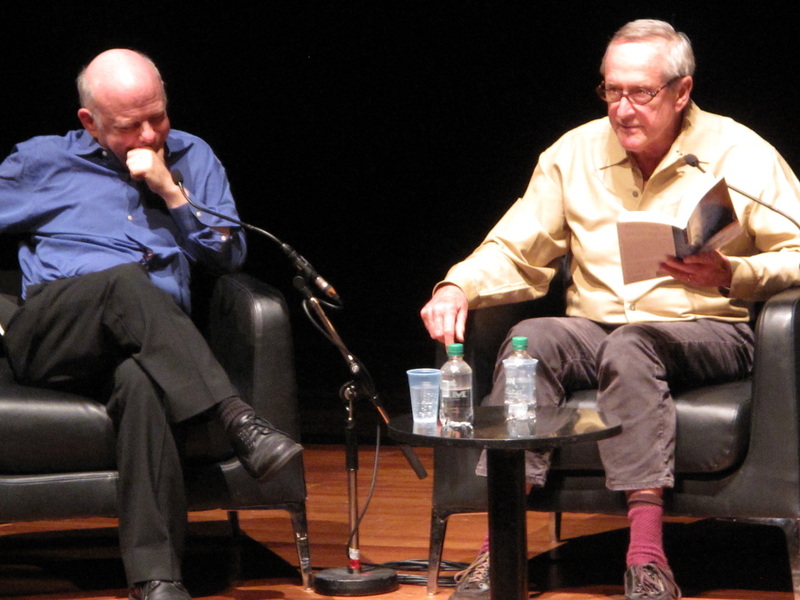 As the host stated, "In conversation with the two greatest conversationists un cinema." I've been fortunate to see them work together on the stage. Gregory directed Shawn in the latter's play, Grasses of a Thousand Colours, at the Royal Court in 2009. They began at the beginning. Obviously. How they met. Gregory says they are like a married couple, who remember history differently. It was at Gregory's production of Alice in Wonderland in New York. Shawn was a young writer. Gregory eventually directed Shawn's plays - he only wanted to direct two playwrights: Wally and Henrik Ibsen. "Andre was the first in professional theatre to accept my writing," Shawn. "We are now the same age, but back then he was a distinguished man and I was a young boy." They talk about their long rehearsal periods, one play four years, My Dinner nine months, and the last - 13 years! Around 1975 Gregory finished with theatre. Something in him made him lose the desire to direct. For those that haven't seen My Dinner, it is loosely based on them as they discuss his decision to take a break from the stage. They are asked about the politics of the play. Gregory says that it was prophetic for the Bush years - torture and fascism. There is also mention of Watergate. Shawn states they were not talking about politics consciously, but kept coming back to it - torture, concentration camps. Gregory, "Artists should be listened to by businessmen and politicians." Gregory thought My Dinner would be funny because their voices are so different. "Almost everything after 10 years seems funny." Shawn shines a light on the process of writing the film - it had to be shaped into characters, to be as interesting as if the characters were made up. The conversations were taped and transcribed and redone. "We kind of played ourselves, kind of." It was written and then sent to director Louis Malle. Gregory, "My Dinner is as large as Lawrence of Arabia because it takes you to deserts..". Shawn says that they are two privileged men. He wanted others working while they are talking. "The waiter represents entire working class and humanity except for us, while we're talking and consuming." He presented himself as the bourgeois defending the status quo. They talked about various directors for the picture: Sergei Einstein, if only he had a sense of humour, Jean Renoir, if only he was deeper. The two certainly have a sly wit. Malle was a great storyteller, and he was very funny, and he liked theatre. They sent him the script. Gregory thought Malle's call was a crank. Malle wanted to direct - if you don't want him he wants to produce, but whatever happens don't show anything, no flashbacks. Gregory, " It is a loathsome process to beg wealthy people for money." Max Stafford-Clark invited them to do 10 performances at the Royal Court. Was arduous to get money. They had to shoot in December because of the director's schedule, otherwise would've fallen apart. Gregory recounts that half the reviews were despicable, terrible. The producer told them, "Don't worry boys, at every dinner party I go to, you're all they're talking about." About doing more films, Gregory says he appeared in 12 rather silly films, except The Last Temptation of Christ. Shawn offers that most of what he'd done was hated, or not liked, except My Dinner. He wondered what it was about that project and perhaps might try to replicate it, but it was a conscious thought not to do that. Countless people asked him why don't you do a sequel? It'd have to be better he thinks. Uncle Vanya is a sort of sequel. Shawn talks about acting; in the theatre you shouldn't think about previous night, just the actor you're working with. Gregory calls Shawn the greatest writer in American theatre. They end the evening with readings from their work - Shawn's The Fever, and Gregory's only play The Bone Songs. They reveal that Ibsen's The Master Builder is being turned into a film with Jonathan Demme. That was the play they were talking about earlier that has been rehearsed for 13 years. I cannot wait! Wallace Shawn and Andre Gregory are funny and charming and self-effacing. They have great anecdotes. Gregory went up to director Stanley Kubrick and thanked him for The Shining, as he felt it was a documentary about his childhood; to which Kubrick retorted, "No my dear boy, it was about mine." We are left with a sober thought, "Our democracy is being extinguished. We are marauding in the world without understanding what we're doing." The only shame was that the audience did not have an opportunity to ask questions. A fascinating evening!